The sailors carefully load the crates into the cargo hold, stacking them on top of each other until the ship is bursting with supplies. The settlers huddle together, trying to stay out of the way of the crew but anxious to see where they are going. New lands and wealth were promised at the end of the journey. The waves crash against the side of the ship as it pushes forward with the wind. A dark line on the horizon slowly gets closer. Soon they will be at the shore of the new land. Across the sea, new land is waiting to be discovered! Put together the best fleet to beat your competitors and grab glory for your nation in Race to the New Found Land. Pre-order your copy from our website or your local retailer. Embarking on a journey across the ocean requires careful planning. Careful assignments must be made for each ship in the fleet to maximize the profit. When preparing for your journey across the sea, some ships are better suited to tasks than others. Ships with a higher crate value can carry more cargo. Ships with a higher settler value can carry more people. Ships with a high spyglass value can discover more pieces of the islands. Each player has a starting ship that matches the flag on their player sheet. You can increase your nation’s fleet by building new ships. Small ships are cheaper but large ships can carry more. Decide which is more advantageous for your fleet. Once you’ve built more ships, they’ll depart for the new world! Players will place their ships underneath the action space on their board that they want to do: load, settle, deliver, or discover. The actions will be resolved later in that same order. Many people are eager to sail and settle on the new land. However, ships can only hold a limited number of people. Larger ships can carry more settlers while some small ships can’t carry any. When resolving the settle action, look at how many settlers your assigned ship was able to carry. ­­­­­If your ship’s settler value is 1 you can place one of your markers onto an empty space of an island tile and claim the reward, either resources or victory points. If your ship’s settler value is two, you can stack both markers onto an empty space of an island tile and choose which island bonus you would like, even if the other space is already covered by your opponent. The new land has a lot of territory to discover. 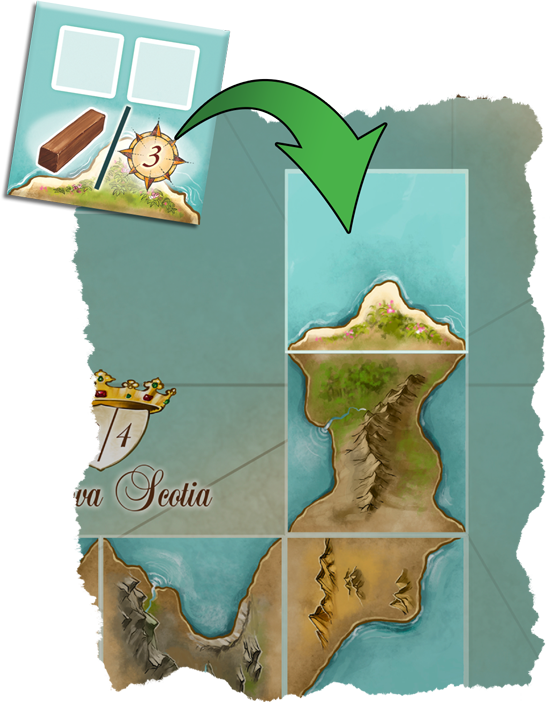 When your ship has been assigned to the discover action, new island tiles will be flipped to fill in the map on the board. The spyglass value for your ship determines how many island tiles you will discover. Once you have drawn the appropriate number of tiles, you can choose the tile(s) you want to place. 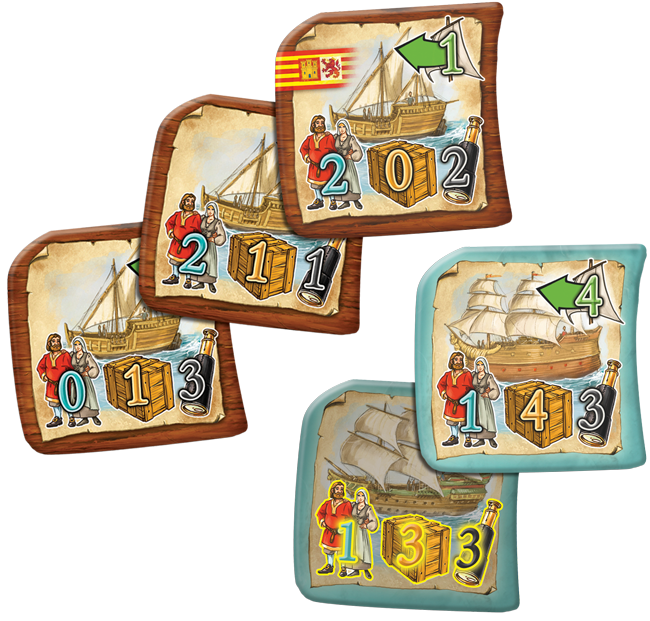 Place the number of tiles equal to the number of ships assigned to the action. The new island tile has to match the island shape where it is placed. Once the new section of island is discovered, place one of your markers onto the empty space and claim both bonuses shown. New lands and riches await! Will you win the race? 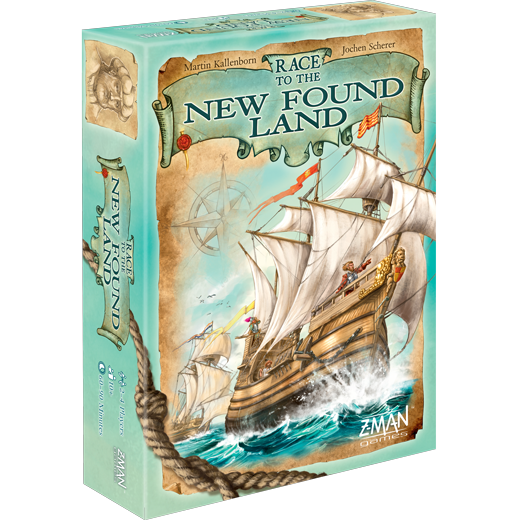 Pre-order your copy of Race to the New Found Land today!